Most odor eliminators are as “natural” as pleather pants. 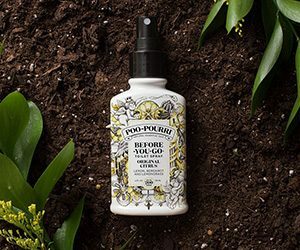 But Poo~Pourri takes natural seriously. We care about your health, your toilet, and this precious world we poop in. That’s why we use NO harsh chemicals—just stink-fightin’ good stuff (oh, and a pinch of magic). Unlike the other guys, Poo~Pourri is safe to breathe and safe to flush.